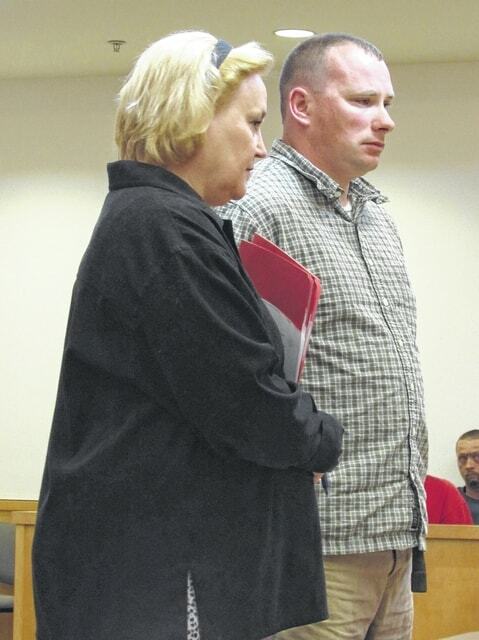 James Sammons Jr. is pictured with defense attorney Kathryn Hapner in the Hillsboro Municipal Court on Thursday. A total of three cases will go before a grand jury after defendants waived their rights to preliminary hearings in the Hillsboro Municipal Court on Thursday. James Sammons Jr., 34, Hillsboro, faces a charge of third-degree felony theft. The Times-Gazette previously reported that Sammons allegedly stole a firearm from a residence while he was working with the Highland County Community Action Organization. On Thursday, Sammons waived his preliminary hearing. He is on reporting probation. His case will go before a grand jury. Also waiving his preliminary hearing was Terry Yankie, 61, Lynchburg. He was charged with fourth-degree felony receiving stolen property after three allegedly stolen vehicles were found at his residence, as previously reported. On Thursday, Yankie entered an agreement with the state. His case will go before a grand jury. The conditions of his bond remain the same. He is under the supervision of the probation department. Yankie also asked the court if his electronic monitoring house arrest could be modified to accommodate his farm work. The state had no objection to that modification. Justin Alexander, 34, Midland, also waived his preliminary hearing. He faces a fifth-degree felony for drug abuse as well as two second-degree misdemeanors for obstructing official business and possession of drug abuse instruments. The Times-Gazette previously reported that Alexander was charged after a Highland County Sheriff’s Office deputy allegedly found him to be in possession of methamphetamine. In exchange for waiving his hearing, the state agreed to reduce Alexander’s bond to his own recognizance (OR). Hillsboro Municipal Court Judge David H. McKenna said Alexander currently has holders out of Brown and Clinton counties. Whenever Alexander is released, he will be on reporting probation. Also appearing on a felony charge was Kenneth Hess Jr., 36, Georgetown. He was charged with fifth-degree felony unauthorized use of a motor vehicle after allegedly using a stolen car in several thefts in Kentucky, as previously reported. On Thursday, that charge was dismissed “without prejudice on (a) motion of the state with (the) consent of (the alleged) victim,” according to records. Charges were also dismissed for Matthew Casey Holaday, 34, Sardinia. The Times-Gazette previously reported that Holaday was allegedly involved in an incident involving golf clubs. He previously pled not guilty to two counts of first-degree misdemeanor assault. Holaday also pled not guilty to an unrelated theft charge. On Thursday, those charges were dismissed on the motion of the state. Defense attorney Conrad Curren said Holaday entered an agreement the previous day in the Highland County Common Pleas Court. He pled guilty to third-degree felony grand theft, as previously reported. Holaday is set to be sentenced on that case next month. Holaday told the court that he is currently serving time in Clermont County and that he is scheduled to be released from there in November. In reviewing Holaday’s record, McKenna said Holaday still has 40 hours of community service to perform on a 2013 theft conviction. As such, Holaday will be on reporting probation whenever he is released. Michelle Kelly, 44, Hillsboro, appeared on a bench warrant that was issued after she failed to appear the previous day on a first-degree misdemeanor for driving without a license. In reviewing her record, the judge said Kelly has never had a license. He added that she was convicted “just a couple months ago” on a similar charge. A 60-day jail sentence was suspended on that case, and Kelly was ordered to perform 60 hours of community service. When asked, Kelly said she has not yet completed those hours. She added that she is currently enrolled in FRS counseling. She also said that, on her newest charge, she was taking someone to the doctor. A 90-day jail sentence was suspended. Kelly must pay $100 of a $1,000 fine. She was placed on reporting probation. This case was also a probation violation “for doing exactly what you were on probation for – driving illegally,” McKenna said. As such, a 30-day jail sentence began on Thursday. Kelly will be furloughed on Sunday. The remaining time is set for next month. “It’s what you do between now and then that might talk me out of those 26 days … not your excuses,” the judge told her. Also on Friday, Deborah Betts, 49, Hillsboro, entered an agreement on first-degree misdemeanor operating a vehicle under the influence (OVI). She pled guilty to an amended and reduced charge of third-degree misdemeanor reckless operation. A left of center charge was dismissed. The state recommended a suspended sentence on the condition that Betts complete a three-day driver intervention program. A 30-day jail sentence was suspended. Betts must pay a $500 fine. Also appearing on an OVI was Rance Ely, 25, Highland. He previously agreed to complete a three-day driver intervention program. On Thursday, the state agreed to amend and reduce the OVI to third-degree misdemeanor reckless operation. A minor misdemeanor for failing to maintain control was dismissed. Fifty-seven days of a 60-day jail sentence were suspended. Ely was given credit for his time in the intervention program. He will have to pay a $500 fine. The judge said this case marked the “second time in five years (Ely has) had a charge reduced.” He added that such a deal is “unlikely” to happen a third time. Finally, two bench warrants were issued. Franklin Barber, 62, Lynchburg, failed to appear for a review of 10 days in jail. A bench warrant for $5,000 in surety or $500 in cash was issued, according to records. His license was also forfeited. Ashley Franklin, 28, Hillsboro, failed to appear for a court trial. She is charged with minor misdemeanor driving without a license, according to records. A $1,000 bench warrant was issued for her arrest.